Montparnasse Tower deserves a collective design. To this end, we brought together our experience and united our teams and resources so that the Nouvelle AOM team can today rise to this challenge that is both architectural and highly symbolic. The tower must reflect many different identities, and we feel that this plurality of vision begins with a team that has shown itself able to integrate conflicting ideas and views, right from the beginning of the project. 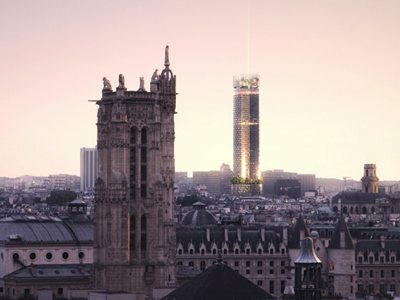 When we decided to undertake the extraordinary adventure that the Demain Montparnasse (‘Tomorrow’s Montparnasse’) international competition represented, it was with a desire to place the tower firmly within the 21st century’s environmental revolution. We nurture five ambitions for the new Montparnasse Tower, which constitute the core of our architectural project. Firstly, Montparnasse Tower must be a tower of its time; in osmosis with the climate, the wind and the changing light of the sky. Consequently, the super-passive, positive-energy, very low carbon tower will be raised to the ranks of the most energy-efficient new buildings. Secondly, the innovative approach to the facade allows the tower to respond to the wind in two ways – recovering the force of the dominant winds at the upper levels, and reducing unpleasant wind currents caused by downdraft around the base. A ‘tower of winds’. We also wanted to use the top of the new Montparnasse Tower to produce sustainable energy: solar panels to supply the tower’s day-to-day electricity, and rainwater is captured in order to water the areas of planting not exposed to rainfall. The vast glasshouse is to produce fruit and vegetables to supply the tower’s restaurants. Our project is also about opening the tower up to the people of Paris. The tower’s various functions will be visible from the exterior via a new, double-skin facade; leaving behind the opacity of the existing tower, the new, transparent Montparnasse Tower will be clear and bright. From the 14th floor, the highest gardens in Paris will add to the natural life of the city. Our fifth ambition is to bring out the beauty of Montparnasse Tower, to exalt this familiar form on the Parisian skyline. Today, winners of the competition, the team and its five partners are ready. We are ready to make this happen for Paris, for the thousands of people who work in the tower, for all the visitors who will come once it opens in 2024. We are ready to go and meet local residents and Parisians to join us in this adventure, to make Montparnasse Tower the architectural expression of Paris’ environmental revolution. By 2030, energy transition will have taken pride of place in the development of Paris; the Montparnasse Tower, designed to work in osmosis with the natural elements, will have participated in this revolution. ‘Super-passive’, raised to the ranks of the most energy-efficient new buildings, the tower will even surpass them in terms of carbon emissions by avoiding the demolition and rebuilding of its primary structure. A responsible tower: this is the oxymoron made possible by the decision to renovate and extend the lifespan of the existing structure and its foundations, which are the highest producers of greenhouses gazes in building. One of the most innovative positive-energy, low-carbon renovation projects, the new Montparnasse Tower, freed of asbestos, will significantly reduce the energy consumption of today’s tower. But as well as being exemplary in energy consumption, it will be beautiful, elegant in its new dress, a reflection of our times, bright and constantly changing. A Parisian tower, completely contextual, symbiotic, its integration within the neighbourhood begins with improving local wind turbulence at the foot of the tower, and with exploiting systems of reciprocal energy sharing with the neighbouring train station and future developments in the surrounding area. The facade is based on two concepts, which come into play up high, above and below the hanging gardens: the first 10 floors of offices benefit from glazed conservatories with access outside onto continuous balconies. These spaces give an almost domestic feel to the lower offices, linking in to the scale of the city around and creating a powerful physical relationship with the surrounding neighbourhood. Projecting out, these balconies also play a role in reducing wind around the base of the tower by interrupting the downdraft, so improving public comfort below. The other element that also contributes to an improvement in user comfort in the surrounding public space, is the slight modification to the periphery of the existing form to create large, tree-planted, sunken patios at the four corners. Thus anchoring the tower into the Parisian soil, they too help to reduce the impact of downdraft onto the piazza, while also helping pedestrians to navigate around the tower between the historical station approach, Rue de Rennes, and the station itself. This tower of winds, Aeolus–Montparnasse, is a tower that protects its community, both inside and outside. On the main body of the tower above the hanging gardens, the wind-sensitive facade that we have designed uses the wind as an ally. We chose to explore the potential of this natural resource (a real aeolicus genius loci), and to exploit the fortuitous perfect alignment of the existing tower with the dominant south-westerly winds. As a result we have given the facades a checkerboard relief of planes, which will ensure that the tower meets 70% of its own energy needs during the working day, like a wind glider that needs no mechanical assistance. The technical workings of the facade are both highly sophisticated and very simple. The subtle checkerboard relief creates a regular micro-pattern of positive and negative pressure zones. A revolutionary skin exploits this phenomenon to encourage air to circulate through the offices, modifying it to ensure occupants’ comfort at the mid-range temperatures experienced through the majority of the year. As the speed of wind increases with altitude, the texture of the skin of our tower becomes smoother as it moves up, adapting to produce a pressure gradient that is consistent at each floor of the tower. This revolutionary skin contributes to a 40% reduction in energy consumption compared with a standard recent tower. The top of the tower is designed as a piece of equipment that produces sustainable energy, harvesting rainwater, solar energy, wind and light. The photovoltaic production of the panels installed on the glass crown are used continuously to meet the daily energy requirements of the tower (annual production from this photovoltaic roof-top farm economises 350MWh of primary energy), and supplies 100% of the electricity required for the public spaces. Rainwater collected at the centre of the funnel-shaped bioclimatic harvesting tank, will meet all the watering needs of the planted areas not exposed to rainfall. An exceptional place for Parisian events. 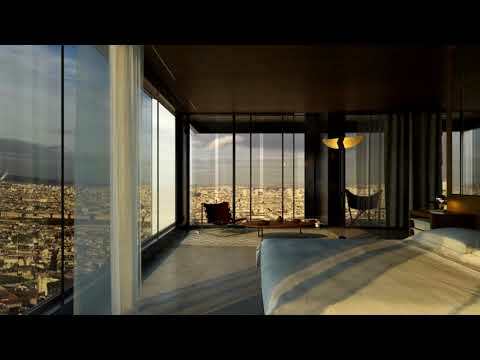 The new Montparnasse Tower will be a destination, open to Parisians, full of new functions for a wide variety of different publics. Our ambition is that all of these activities, this life, be visible from outside through a bright new, transparent facade. But also outside in the public space, with new attractions on the redeveloped piazza to renew the whole feel of the neighbourhood. This ‘Montparnasse Time’, structured by a permanent listing of cultural happenings and events on all floors of the tower, will make it possible to give new meaning to the office tower and its unusual visibility within Paris. From the very start we felt that a vertical distribution of functions would give the tower an urban intensity. From the first round we proposed new functions for the old service floors, optimising and improving them, accompanied by a clarification of the different lobbies. First of all, redeveloping 20,000 m2 below ground over three levels, naturally lit thanks to new lightwells, to house the ancillary functions related to the tower and other activities complementary to the offices. Then, between the 42nd and 45th floors, a sensational hotel; and finally, a visitor experience that is enlarged to include the open-air panoramic level as well as the events venue of the great glasshouse. The bioclimatic design of the envelope contributes to a new way of experiencing internal spaces. The new tower provides 4,500 m2 of gardens designed in consultation with an urban ecologist, 5,000 m2 of balconies, 9,000 m2 of conservatories and loggias. But above all, on the 14th floor, it brings the highest gardens in Paris; real hanging gardens at the height of the roof of the Pompidou Centre! Montparnasse Tower has long suffered from lack of image. To turn the page on a new chapter in its relationship with Paris, the new tower needs to carry a powerful environmental message. Designed from the outset as an energy-efficient building, it is well placed to undergo restructuring to reveal its potential by making it reactive to its environment. We saw this competition as an invitation to exalt this familiar form on the Parisian skyline, to change the image of the tower rather than that of the city. The new Montparnasse Tower, metamorphosed from inside out, has a lasting, discrete, glowing beauty. The great celestial glasshouse affirms its silhouette on the Parisian skyline, like a glass cathedral extending its form, which we felt should be tall, elegant and decidedly Parisian. Its new architecture lifts the opaque curtains that shut it off from its surroundings. In its newfound brightness and contextual silhouette, adapted for new uses, the Montparnasse Tower is no longer just an office tower, but a place for life, as vibrant as a vertical neighbourhood. Crystalline, it displays all its resources and potential. Up into its heights, the hanging gardens, the hotel and the celestial glasshouse offer a multitude of experiences, which are as much about a new view of the city as they are about drawing the eye from near and far. Making the step from Modernism to the digital age, the tower becomes a 24-hour showcase for artworks and landmark. Art irrigates its spaces, vertically and horizontally, with permanent works integrated into the architecture, as well as a regularly updated programme to contribute to the public, cultural and nocturnal life of both the Montparnasse neighbourhood and the City of Paris. Nouvelle AOM is the collective created in June 2016 to enter the international Demain Montparnasse competition. Formed of the association of the founders of three seperate Parisian practices (Franklin Azzi Architecture, Chartier-Dalix, Hardel et Le Bihan Architectes), it is a new, independent entity, working in collaboration with a team of highly qualified, Paris-based consultants, including Setec, T/E/S/S and Elioth. Five associates, because we felt that the Montparnasse Tower deserved a collaborative design, that it must be the reflection of multiple entities. The name refers to AOM, the collective of architects who designed the original tower, which was built in 1973: Agence Architecturale pour l’Opération Maine-Montparnasse, made up of Eugène Beaudoin, Urbain Cassan, Louis-Gabriel de Hoÿm de Marien and Jean Saubot. The architects of Nouvelle AOM are of the same generation as the tower, grew up in the neighbourhood, and loved it. In October 2016, finalists selected out of 700 candidates, they brought together a team of about 50 people on the 44th floor of the tower to form a laboratory of design and research, producing models on site, working, collaboratively, on the project for the tower they dreamed of for Montparnasse.